The death of a pet can be a significant loss in a child’s life. Parents often underestimate just how much an animal can mean to a child. Often these bonds with a first or special pet will linger in the memories of a child turned adult forever. As an early education trainer, I have come to understand that how the important adults in a child’s life react and teach about a child’s first experience with death will impact their understanding of all loss in life. By telling the truth and recognizing and honoring the deep attachment of child and pet, it will relay the message that all life is precious. 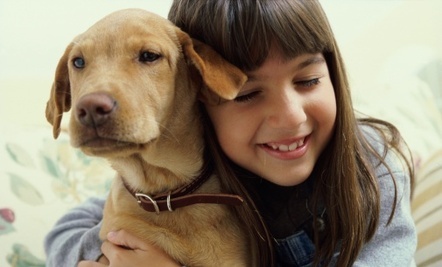 Tell children the truth about the pet’s death or other events surrounding the pet’s leaving. Allow the children to see the pet after it had died, if the body is relatively intact. It helps make the death real. Have a funeral and burial for the pet when possible. If pets are too large to bury, or backyard too small, a memorial service is an appropriate ritual. Let the children have a part in creating it. Acknowledge the children’s memories and encourage them to talk about the pet. Encourage children to express their feelings. Express your own. Be aware of the child’s guilty feelings that in some way the death or disappearance of the pet was his or her fault. (Why didn’t I stay home from school that day? Why did I let my dog go outside?) Discuss ways the child was good to his or her pet. Discuss regrets too. Use rituals to work through grief. Look at photos. Write down feelings and memories. Draw a picture of the pet. Save a special object like a collar or ball. Have the parents inform the child’s school. Have educators let the child know they care. Use discussions as a teachable moment for the classroom. Please check out one of my latest books How To Explain Death, Loss & Grief To Children at www.ArtichokePress.com This book was written to help parents, teachers and important adults talk to kids about the reality of death without scaring them. I Miss You-Do Pets Go To Heaven? Is a great kid’s book that I wrote after a visit with a grandchild. Order it today. You will be glad you did. When my dog Rory had to be euthanized when I was eleven, I snipped a bit of her fur off and kept it in a little clear container with a label reminding me of what it was. I still have it somewhere. It helps me, as a child, commemorate her life and remember her. Great tips! We have had several pets pass since having my daughter. She’s 10 now and still remembers those that are no longer with us. We continue to share memories, stories and photographs of our friends who are no longer with us.